I have a friend (who is blissfully ignorant of the existence of this blog) whom I love dearly but she is one of the most negative people I know. She could be on an all-expenses paid cruise in the Caribbean with her children being cared for by Mary Poppins and she would still have plenty to complain about. Unfortunately this is contagious. After a while with her I find I make Eeyore look like a unfettered optimist. This is not necessarily healthy and so today I purposed to be thankful. I'd thought I'd share with you some of the stuff that brought me joy today. -Mini bell peppers were on sale at Wal-Mart. They really taste too good to be a vegetable. Plus, they were in the range of affordable and NO ONE else here likes them so I can have the whole box to myself. I almost did a little flip in the produce aisle but I prefer not to be the weirdest person at Wal-Mart so I refrained. -Way Cooler and I booked flights to Texas for October. He has to go for a conference and since his hotel and food are paid for we freed up some air miles and The Geek will do Dallas. Actually The Geek plans to spend all 4 days eating her way across the metroplex. Southern food always makes me grin. - I saw a robin today. Now I must confess, usually the only birds I like are stuffed and roasted with a side of mashed potatoes but a red-breasted robin just screams Spring to me. In my books, Spring is all joy all the blessed time. - My four year old playing soccer. It may not be a thing of beauty, but it certainly is a joy forever. -My latest tea find: Higgins and Burke Orange Butterscotch tea. Don't let the name dissuade you, it is pure joy in a mug. -The Compassion bloggers. Reading them moves me, inspires me, and brings me a joyous hope that even I can actually do something about poverty. And that's a joy worth having. What about you/ What brings joy into your coner of the world? Last week I was thumbing through a Company's Coming Cookbook. For those of you South of the border, you may not be aware of this Canadian sensation. In the 80's a lady from small-town Alberta published a cookbook using everyday, easy ingredients. It was a hit and that cookbook spawned an empire. She has sold millions. It's an entire series of cookbooks that use a lot of canned soup, frozen whipped topping and liquid smoke (I kid you not). Some in the series are better than others. I'd be totally lost without my Muffins and More book but the Make-Ahead Meals book I was looking through? I doubt I will EVER make more than 2 recipes from it. The following may explain why. 2 cans of stewed tomatoes with juice, broken up. Make sure you break them up because really, who wants a whole stewed tomato in their raspberry jello? Apparently there just isn't enough acid from the raspberry jello and 28 ounces of tomatoes, a little orange juice will help ensure that your stomach lining is completely eaten away. The burning sensation will detract from the fact that you just ate jello made with stewed tomatoes. Yep, there is a sauce. The directions call for it to be piped around the jello mold in a decorative fashion. Classy. Apparently Jean isn't a big Mary Poppins fan or she'd be advocating a heck of a lot more than 1/2 a tsp. I so wish I was making this up, but I'm not. The preceding was taken from Company's Coming Make-Ahead Meals by Jean Pare. Me neither. But I'm going there virtually this week. A group of bloggers just packed their bags and went to Kolkata (I had no idea Calcutta's name had been changed either). They are going to be blogging about the work of Compassion there in India. They'll be telling us about the extreme poverty, the extreme living conditions and the extreme hope that can be found when people share of their wealth. Visit their blogs this week. Read often. If you are the praying sort, pray for them, and most of all, learn how you too can release a child from poverty. Last week Way Cooler was stuck at Wal-Mart for an hour or so while our winter tires were being switched out for summer ones. This is a guaranteed way to bring on more winter. So if you live in my neck of the woods, I'm sorry, this latest snowfall is totally Way Cooler's fault. For all my Southern friends, I'm from the Canadian prairies. It was so warm on Monday that we were in shorts. Today we have snow. TOTALLY NORMAL. Not fun, but hey, that's the price you pay for living in God's country. ANYWAY, he had time to kill so he called and asked if I needed anything. Completely forgetting the whole potato incident I asked for green grapes and a bag of icing sugar. He brought home four DVDs and this. 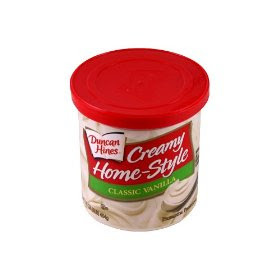 A tub of trans-fat and high fructose corn syrup. The poor guy was totally dumbfounded when I told him that was not what I was looking for. I had to show him the nearly empty bag of icing sugar. Which, by the way, is a staple in my pantry. On the other hand I've only purchased the heart attack in a can once in 12 years, then read the label and promptly donated it to the food bank. But hey, at least he didn't bring home twenty pounds of it. On a different and much healthier food note, the cucumber has been located. My sister All you OCD types can now sleep tonight. It was in the crisper drawer where I left it. The crisper drawer I checked three times. Is it too early to sign up for a nursing home? I have friends and relatives that have passed the other side of 50. I notice an interesting phenomenon among some of them. Every time they forget something, they are certain that their mind is starting to go. No amount of assuring them that this is indeed normal and they were forgetting things long before they were old a little more advanced can dissuade them. So, as a service to them I'd like to offer concrete proof that you don't have to be old advanced to lose your mind. The following events have all taken place last week. I put the milk away in the pantry. When my kids called me on it I totally faked them out and pretended that I was just checking to see if they were paying attention. Yeah. That was it. When baking bread the other night I put the bread in the oven, set the timer and went downstairs and completely forgot about the bread. I also forgot that I am hearing impaired and there is no way on earth I will hear the timer if I am not standing directly in front of it. Turns out you can bake bread for double the recommended time and not burn it. You will have four inches of crust, but the bread remains un-scorched. Good thing my sons will eat anything. I left the garage door wide open the other night. All night. All that was missing was a sign that said "Welcome thieves. Please take my van and lawn mower. The spare housekey is in here somewhere too. Start looking." Fortunately I also forgot to post the sign so everything was still in place in the morning. I have misplaced half a cucumber. It's no longer in my fridge and I can guarantee I did not use it up. Way Cooler only eats veggies when they are peeled, cut and forced upon him so he's not to blame and while my kids are healthy eaters if they are gonna steal something from the fridge chances are good it will not be a vegetable. So if you see a lonely half a cucumber somewhere would you mind sending it home? There are more, but that is all I care to share at this time. Any more and the nice people from the Department of Families and Children are going to pay me a visit and there is no telling what I'd forget when they are here. We run into each other every week. Her son is in the swimming class after my son. But this week was different. This week I saw her. She was easy to miss. Her son commands attention. He is big, loud and talks all the blessed time. He is a wonderful, loving boy who is profoundly delayed. She is as quiet as he is loud and usually blends into the background. Derrick is fascinated with my two year old, so my encounters with him and his mom have often been all about keeping my little one safe as Derrick is unaware of his strength and lacks the social boundaries of most eleven year olds. We've been sitting together for eight weeks now and I don't even know her name. But last week was different. Maybe it was the sigh she let out as she settled onto the world's most uncomfortable bench in the cramped viewing room. I'm certain she wasn't aware of it, but the sound penetrated my wall of busyness and I looked again. I no longer saw a quiet women with dowdy clothes and roots that really need attending to. I saw uncertainty. I saw a mom who has ambitions and hopes for her son but they may never get realized. I saw a woman who may attend a graduation but not a wedding. Someone who will help her son get a job but most likely never a career. Someone who loves her son deeply and knows that most of the world will never truly understand him. I saw her weariness, her frustration from dealing with a system that thrives on red tape, and her fear for Derrick's future. But most of all, I saw a mother. I saw love in action as she tenderly re-directed her son, shared delight as she watched him jump into the pool, and an abiding joy that sprang from just being Derrick's mom. This post is an entry to Scribbit's Write-Away Contest. Visit her on April 21st for a run-down of all the entries, including the winners. Thanks for all your kind words regarding the headaches. They've been a pain but there are a lot worse things I could be dealing with. I have found a way to help relieve the pain of the headaches. Last Monday I went to a new dental hygienist. She's thorough. Unbelievably so. There is absolutely no plaque whatsoever left on my teeth. Unfortunately I'm sure she also removed most of the enamel, but hey, my teeth are CLEAN. In the long, long process of removing all that darn plaque she might have irritated the gums a teensy bit. By teensy I mean swollen and insanely sore gums. But hey, my head didn't hurt nearly so much. And that's a good thing, right? Another technique I have been using for headache control has been laying down for a quick ten minute nap. This worked really well before I had kids. Now, not so much. Yesterday Spud wanted to lay with me. I told him that was fine but he had to lay still and not talk. I might as well have told a goldfish to fly. Both are biologically impossible. After being smacked in the head for the 400th time, having the covers whipped off me twice and listening to his version of Barbara Manatee I asked him to leave. I really am never going to be nominated for Mom of the Year. The tears welled up and overflowed and he cried as though his heart would break. Broken hearts trump sore heads every time. He got to stay. I did finally see a physiotherapist and he was much better than the quack-a-doodle I saw before. He has given me some new exercises. This is also good for distracting my body from the pain in my head by creating pain in my arms, neck and lower back. I saw him again today and he has wisely discontinued some of the exercises. I may have said something about keying his car if he didn't, but I cannot be certain. The headaches seem to have clouded my memory. Wow, a whole post about headaches. Yawwwwwwn. I'm sorry. Let me at least make it up to you by linking to some of my favorite chuckles of the week. The Queen B's joy is made full. Tonggu Momma finds the apple doesn't fall far from the tree. And Shaun makes a really cool cake. I'm planning to show this to Way Cooler. Anything would be better than my butterflies. This Whole Blog Really Should be Titled "Things I Stole From Beck"
The following is a real live conversation with my sister one night when my hubby was working and hers was out of town. To make it more interesting, I have turned it into a movie. Because I am cool like that. I saw the animation on Frog and Toad and loved the idea. It's multi-media. I'M HIP! Or something like that. All's well that ended well. The toilet did not break and my sister, well, she's a plumbing genius. I was looking at the ever-increasing amount of drafts I have. Most of them are underwhelming in their mediocrity. However, the first sentences are often intriguing, it just goes down hill from there. Rapidly. Lightening speed. So I thought I'd share the best of the worst. Way Cooler is working tonight so I watched Toddlers and Tiaras for the first time. And the last. What is wrong with those people? Who puts mascara on a five year old? The post quickly down-graded into an angry rant about parents with entirely too much time on their hands. But I'm not much fun when I'm shrill, so that post will probably never see the light of day. I don't know if you've noticed or not, but we seem to be in a tiny bit of a global econmic crisis. The mainstream media seems a bit reluctant to talk about it. Am I orignal or what? Just what you wanted. ANOTHER post on the economy. And not just any post, a dreadfully boring one. OK, maybe I'm the only one who feels this way, but isn't The Office a spectacular mess? Way Cooler loves that show and and I watch it with him (because I am sweet like that,) but the whole time I keep wanting to jab a fork in my eye. It's like junior high, only more awkward. And really, that is all the space on this blog that The Office will ever get. I believe I have mentioned before that I am hearing impaired. This is where really lame people pretend to talk and just mouth the words. A post about hearing aids. What's next, false teeth? There you have, it the dregs of my drafts. 1. I attempted to night train both boys last week. That's a Lot.Of.Laundry. Oh my stars. Spud is now doing quite well, and has been dry most nights. Sprout was quite delighted with a legitimate reason to come out of his room 18 times in one hour and managed to squeeze out 2 or three drops each time. And yet he still wet the bed every night. For the sake of my sanity, his night-training has been suspended at this time. 2. Did you know that 40 days is a very long time to go without pop? A VERY LONG TIME. 3. Spud starts soccer in three weeks. His soccer field has a hill on one end of it. People were still tobogganing on it TODAY. I'm not holding out a lot of hope for soccer. Winter may never end. Never. 4. I put a few items on Kijii last week. I had a lady interested in one item. She asked me a bunch of questions in 9 different e-mails which I looked up the answers for and promptly answered. She FINALLY made arrangements to come get the item which was very reasonably priced. In her last e-mail she asked if I was willing to bargain and gave me a much reduced price. I told her the price was firm and she then changed her mind. GRRRRRRR. I really, really hate selling used stuff. Be it kijiji, ebay, or a garage sale, I hate it all. 5. I tried baking pitas last week. My thought was "how hard can it be?" If you like half-risen, paper thin, overly crispy pitas that take 5 minutes each to roll out, it's not hard at all. If you prefer pitas that are actually edible, my advice is to stick with the store bought ones. 6. The posting has been rather thin over here for the last little while. I've been dealing with headaches pretty much every day for two months now. They are just headaches, something I've dealt with all my life, but the sheer volume of them has knocked the creativity right out of me. I start physiotherapy next week and hope to be right as rain and boring the pants off of you on a regularly scheduled basis in no time. 7. It just wouldn't be 7 quick takes without a little veggie action. I fully blame this song for the rash of recent headaches. Head over to Conversion Diary for more veggie-free Seven Quick Takes. Yeah, that's all my kids heard today too.